The Bristol Britannia was the world’s first long range ‘jet-prop’ airliner. It was developed as part of the drive to re-build Britain’s civil aviation industry after the Second World War when the focus at the Bristol Aeroplane Company had been mainly on bomber production. 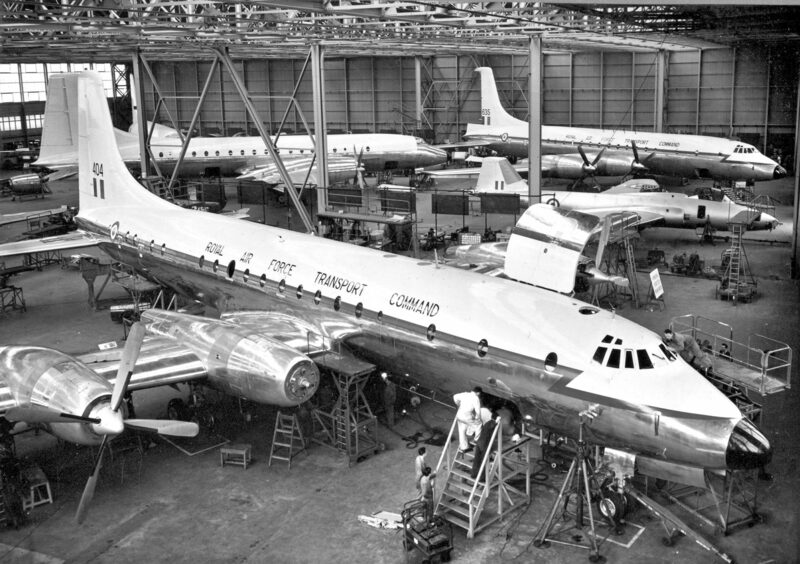 The ancestry of the Bristol Britannia can be traced back to a specification issued by the Brabazon Committee in 1943 with the concept for a long range airliner suitable for BOAC’s post war Empire routes. BOAC issued a revised specification in 1947 initially powered by Bristol Centaurus piston engines but this was revised in 1948 for the power to be provided by the newly designed Bristol Proteus, a turbo-prop engine. Contracts were signed in 1949 and after many and protracted changes to the initial design the prototype Bristol 175 first flew in August 1952. The Bristol Proteus engines which powered the Britannia were the first in the world to have “control-by-wire” using the ‘Ultra Throttle’ system which was later to be used on the Concorde. Sadly, the Proteus is mostly remembered for icing problems, which after much modification were mostly rectified. Test flying was also not without incident caused by other design issues …some of a serious nature. This affected the whole programme and it was not until March 1957 that BOAC operated their first scheduled service with the Britannia Series 102 to Johannesburg fully eight years after the initial proposal was issued. It was at this juncture that the term ‘The Whispering Giant’ was coined by the press which were impressed by the quietness of the aeroplane both inside the cabin and outside. Bristol had not been exactly idle and were already constructing a larger and longer range aircraft capable of flying the Atlantic non-stop, the Series 300. In June 1957 a development aircraft made a record breaking non-stop flight from London to Vancouver on the west coast of Canada against the headwinds – a distance of roughly 4200nms. This was just one of several record breaking achievements. Production aircraft, the Britannia Series 312, were introduced on BOAC’s first scheduled non-stop transatlantic passenger services in December 1957 (source). For all the Britannia’s attributes, sales of the Britannia proved sluggish mainly caused by the protracted introduction into airline service and thereby having to compete with the new jet airliners emerging from the USA. In 1955 Bristol Aeroplane Company issued a proposal for a military transport based on the Series 300. The Bingley committee set up in 1955 to establish future inter-service requirements recognised the need for such an aircraft and an order was made for 20 Series 253s (RAF C.Mk1) plus 3 Series 252s (RAF C.Mk2); the latter built to a lesser specification and initially allocated to the Ministry of Supply. Bristol sub-contracted Short Brothers and Harland of Belfast to be responsible for the construction of most of the aircraft plus the design of the cargo door, the full length metal floor and fittings for the rearward facing seats. In addition the aircraft were to be powered by the more powerful Proteus 255 engine. All aircraft were delivered to the RAF and MoS in less than 12 months and were named after celestial bodies …‘Regulus’ being the brightest star in the constellation ‘Leo’. As a long range military transport aircraft the RAF Britannia C.Mk1 could lift eighteen and a half tons over 4,000+ miles, carrying freight only or up to 53 stretchers with medical personnel and life support equipment or a total 115 passengers … or a combination of all three. It was the RAF’s first strategic airlifter and a crucial component in the reshaping of Britain’s armed forces to meet the threats of the Cold War. Tasks included the rapid deployment worldwide of the then newly formed Army Strategic Reserve and also moving the V- Bomber Force detachments to the various dispersal airfields from their main bases in times of tension. The Britannia was flown jointly by 99 and 511 Squadrons, firstly at RAF Lyneham and later at Brize Norton. When the Britannia was withdrawn from service in 1975 as part of defence cuts, the Squadrons were stood down but in 2000, 99 Squadron was reformed to fly the Boeing C-17 Globemaster at Brize …different aircraft but similar role. Britannia Series 253 C.Mk1 XM496 ‘Regulus’ ( the very last Britannia to fly) is located in the heart of rural Gloucestershire at Cotswold Airport near Kemble and can be viewed on the public open days. The preservation of “The Whispering Giant”, as the Britannia is affectionately known, has been a labour of love for all the volunteers who have taken XM496 from being close to being scrapped to a restored, although un-flyable, aircraft. For further details of the XM496 story please visit this page where you will find details of the restoration. The Bristol Britannia XM496 Preservation Society is registered with the Inland Revenue as a ‘Not for Profit Organisation’. The work is carried out entirely voluntarily by the small group of working members who freely donate their time. The Preservation Society is restricted solely to the preservation of XM496 but the Society does have links with other organisations and charities. For further details please see our sponsors’ page. The Society, like many other similar organisations is always on the lookout for new members of all ages and abilities. If you feel you can help or if you would like to sponsor the XM496 Preservation Society and have a link on the web site please contact us and request information from the Treasurer or Secretary.